Hiya guys! Today I'm sharing swatches for Lollipop Posse Lacquer's July contribution to the Polish Pickup Collaboration. 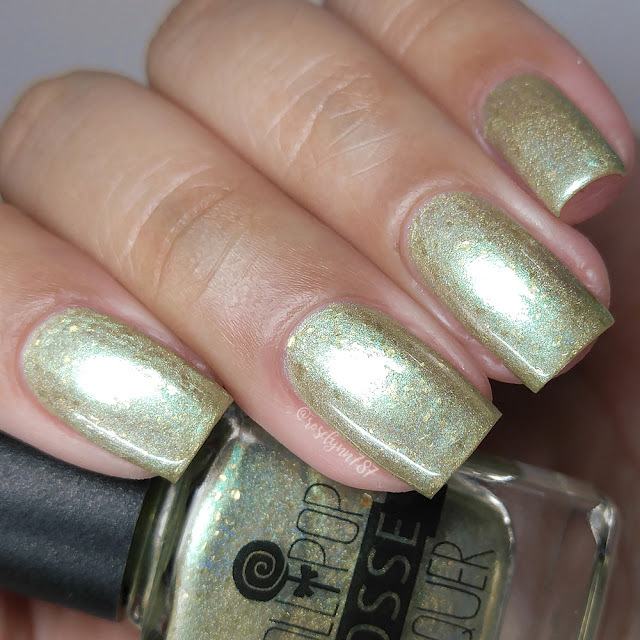 If you're not familiar with the concept, the Polish Pickup offers a fun, interactive experience that allows you to submit theme ideas, vote for your favorite theme, and selectively purchase your favorite polishes every month. This month the theme is.... Cocktails and Mocktails! Yes fam, it's time to get lit! I'm clearly already there if I'm using words like 'fam' and 'lit', haha. Let's just get straight to the swatches before I embarrass myself any further. 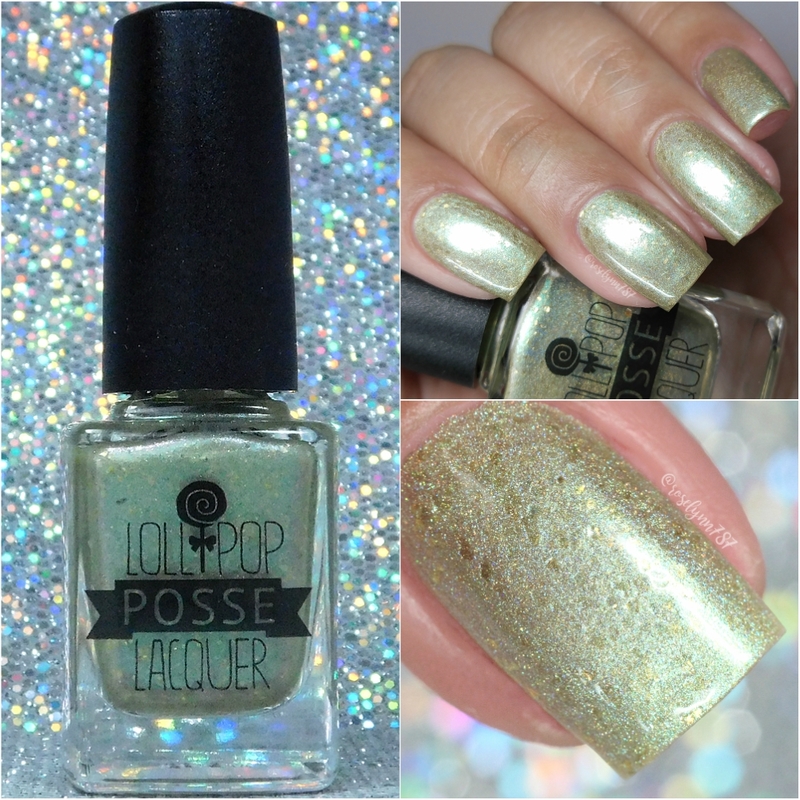 Gin and Juice by Lollipop Posse Lacquer will be available for pre-order through the Polish Pickup Shop July 7th to July 10th. This full-size 12mL shade will retail for $12 each. Once again this month, Lollipop hasn't used an inspiration photo. Instead they have done what they do best and taken their mojo from music, old school summer jams to be exact. "With my mind on my money and my money on my mind..."
Gin and Juice can be described as a holographic gold to green duo-chrome that suspends gold flakes. Looking at this shade in the bottle does it no justice, it's such a dimensional color. The use of the gold flakes really makes it pop and shine. 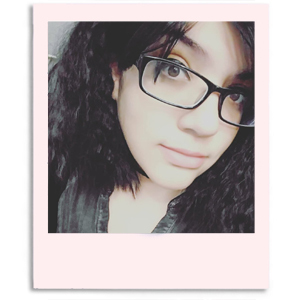 Now I have to say... the shade looks stunning against my skin-complexion, I absolutely love it. I normally tend to shy away from this color-scheme, but not this time. The formula has a sheer application that builds-up evenly on the nail. It's so shimmery and the flakies build up flawlessly in between the sheer layers. There are plenty of flakies per brush stroke without any clumping. Consistency wise it's very balanced and smooth, not too thick or too thin. Shown here in two coats and sealed with a glossy topcoat. 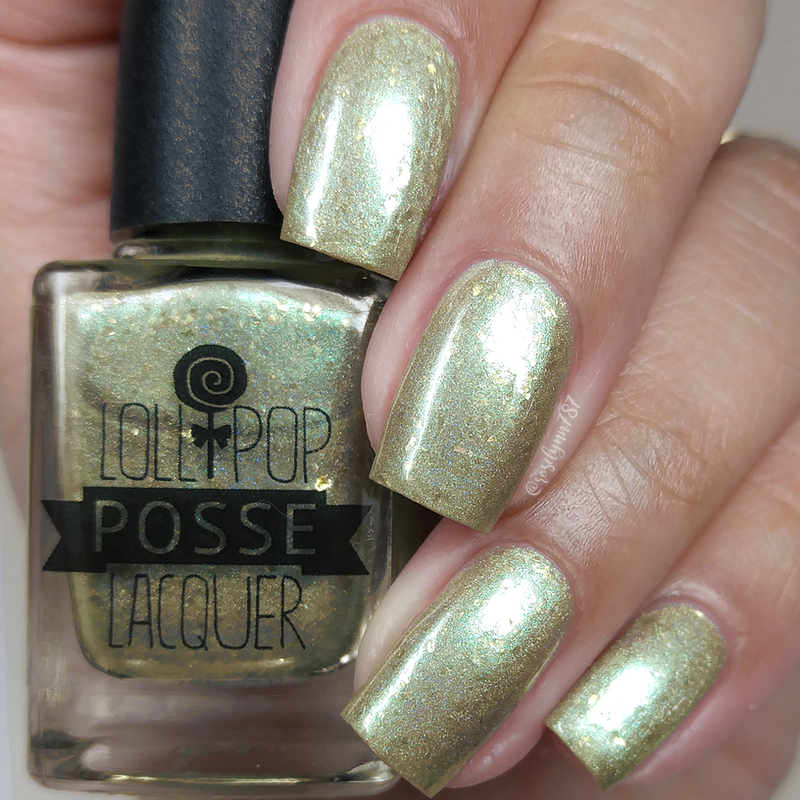 To recap, Gin and Juice by Lollipop Posse Lacquer will be available for pre-order through the Polish Pickup Shop July 7th to July 10th. This full-size 12mL shade will retail for $12 each. Be sure to join the Facebook group Polish Pickup Pack for more details and also check out the other makers involved for the month of July!